There are no rules or laws in place that dictate when or even if you should ever hire a personal injury lawyer. In actuality, the ultimate decision is yours, but common sense tends to land on the side of finding a lawyer and to do it as soon as possible following the accident or incident. If you have suffered an injury as the result of a car accident it is in your best interest to hire a personal injury lawyer, especially if you end up filing an insurance claim. First and foremost, insurance claim adjusters are not on your side. Their job is to get the best possible result for the insurance company, leaving your interests by the wayside. A personal injury lawyer with experience in car accident litigation knows how insurance companies tend to operate. They will be helpful in making sure you do not get the run around and get the compensation you are entitled to. Now, car accidents are only the tip of the iceberg. Most, if not all, personal injury lawyers also handle cases like motorcycle accidents, boating accidents, bike accidents, mass transit accidents, ridesharing accidents, truck accidents and injuries that may be the result of any of those including catastrophic injury and wrongful death. Catastrophic injuries are important to note because they tend to either be a long term injury or a permanent one. In either case, it is again extremely helpful to contact a personal injury lawyer. This lawyer will be most useful because he or she will be dealing with all the legal aspects while you can focus on your recovery or adapt to any changes in your life. An experienced lawyer also knows how to make sure you can successfully prove your long term or permanent injury. They will take on the task of following up with any and all of your medical professionals to strengthen your case. Any case where you must prove negligence or pain and suffering are cases that could use an experienced personal injury attorney. Slip and fall accidents are big ones, especially if you end up injured. 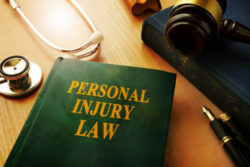 An experienced personal injury lawyer will know how to prove negligence on the part of the owner or person responsible for keeping the area safe. When it comes down to it, a lawyer is the best and safest road to take in order to put you in the best possible position following an accident or incident that resulted in injury. In New Jersey or Pennsylvania, the lawyers at the Law Offices of Richard A. Stoloff have the tools and experience to help with your legal proceedings. Call 609-601-2233 (NJ) or 215-988-9800 (PA) or fill out our online contact form today to schedule a free consultation.